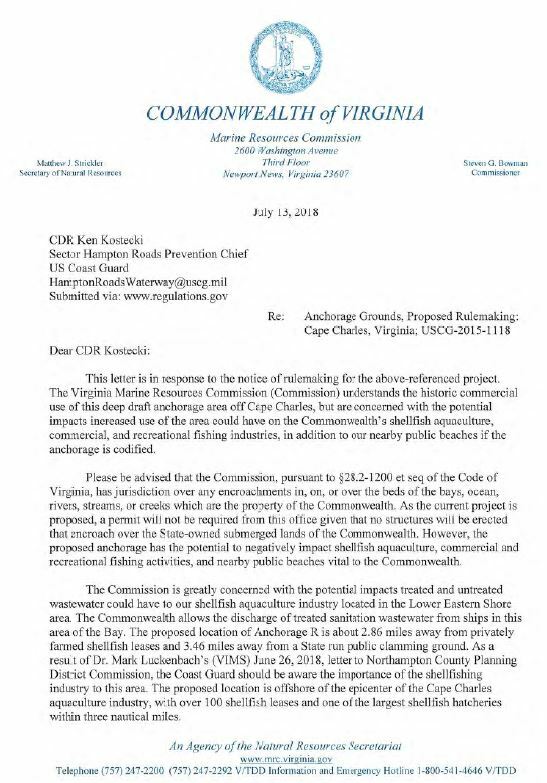 The Virginia Marine Resources Commission has communicated to the US Coast Guard its concerns for the proposed anchorage off the coast of Cape Charles. A letter was sent to CDR Ken Kostecki on July 13th. Here Here to the VMRC ! We ABSOUTELY NEED the Coast Guard to understand that the Aquaculture Industry is a HUGE BOON to the entire Eastern Shore Of Va. The destruction of that inlet water to the mentioned hatchery would destroy much of the shellfish industry here for an entire year. The Coast guard needs to understand that hatchery needs to be protected from harm as much as The Airrcaft Carrier in a Fleet needs to be protected. That Hatchery is the Mothership. Only a miniscule amount of detergents, acids, petroleum waste, as examples, would be needed to cripple thousands of households here. We only have about 40K full time residents. Does the Coast Guard see the simple arithmetic ? Please, realize the goal of protection through prevention, and do not wait ’til after the destruction, after the mess, to help clean it up. There must be another, and less sensitive area, to anchor ships.